As content creators we always want to ensure that the message we’re trying to get across to our audience is understood. Added brownie points if our audience really enjoyed consuming our content! If you repurpose your blog post into an infographic, you are more likely to meet both of these requirements. 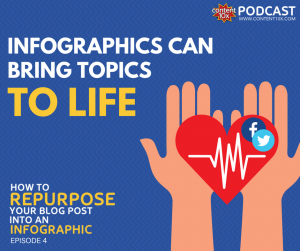 In this post and this week’s podcast episode I’ll explain why it's a really good idea to incorporate infographics into your content repurposing plans, and some tips and tricks on how you can go about repurposing your blog post (and video or podcast) into an infographic. ​Surely everyone loves infographics, right?! Check out this infographic and tell me...is it not just fun? An infographic on how to moonwalk..love it! They’re visually appealing, highly engaging and they're really good for certain types of blog posts or podcast episodes. For example, episodes where you’re listing something out for your audience, like ‘10 Reasons To Use Infographics’! Infographics are really effective when you're simplifying a complicated concept. Comparisons and explanations work well too. Infographics are not only visually engaging, but they have a tendency, if done well, to bring topics to life. Did you know that scanning is the new reading?! Infographics enable us to scan and learn. Whilst infographics can be consumed very quickly, the creator of the infographic is still able to convey their key message. Infographics feed our short attention spans! I consider infographics to be best for your high-end, flagship content. They’re probably not something that you’re going to create for every blog post. Deployed well an infographic can convey your message really effectively and enhance your audience’s experience. Pinterest is an obvious place to put your infographic. When people think infographics, they often think of Pinterest because there are so many infographics on there. That's great if your audience hang out on Pinterest or if you're trying to reach an audience there. But what if Pinterest is not right for you? Fear not. You can also share your infographic on the other social media platforms. As well as Facebook and Twitter, don’t forget LinkedIn and SlideShare too. Another great place to put your infographic is your own website. If you've turned a blog post into an infographic, then putting the infographic there with the blog post is often a good idea. Another really good strategy is to include the infographic as a download on your website in exchange for an email address. What you've done here is you've turned the infographic into a list building tool. There are lots of different places to put your infographic and plenty of places/people to share it with. Whist this post is focussed on repurposing blog posts, what I’m about to cover is widely applicable to any written content. For example, I've seen many sales pages turn into infographics and that can work really well. If you have a podcast episode or a video, then I highly recommend getting that transcribed into written content. You can either do this yourself or outsource it. If you opt for the latter, you do it really easily using services like Rev who charge $1 for one minute of video or podcast content, or Fiverr. Then you have written content with which to plan out your infographic. Which blog post or podcast episode should I repurpose into an infographic? Clearly, it’s up to you – there are no set rules but here a few pointers. 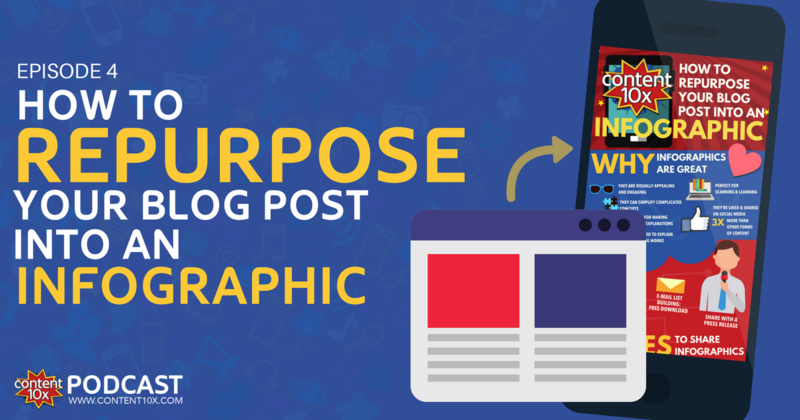 You can repurpose your brand new blog post into an infographic, or you can repurpose older posts. If you repurpose an older post I really recommend using your analytics (Google Analytics, or perhaps you have other analytics tools that you use as well) to look at which posts are the most popular. If people are liking the post and the content, then it's highly likely they'll love your infographic, and you may want to consider making the infographic a content upgrade available by email. Or, you can add the infographic into the post itself and share an embed code for people to embed your infographic elsewhere. Firstly, turn your blog post into a storyboard. 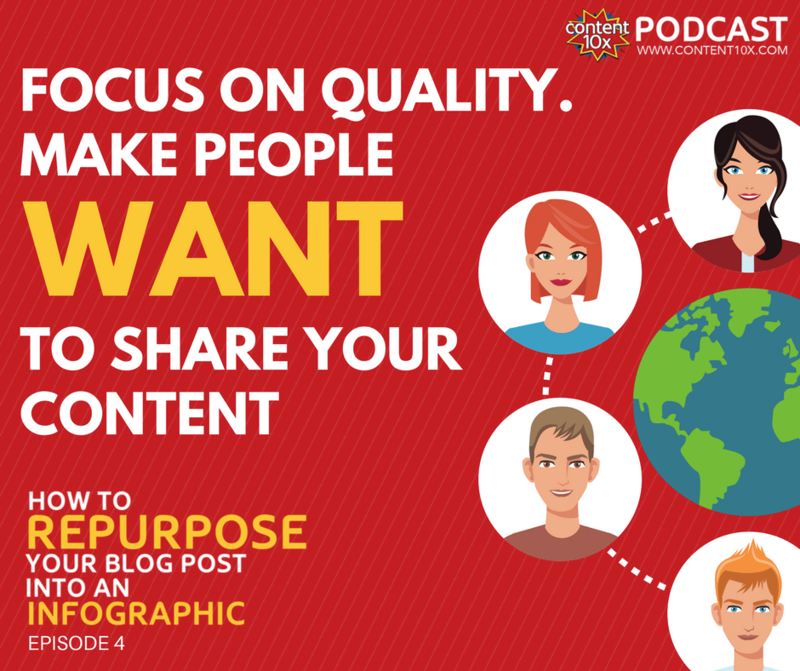 You need to read the blog post and work out what you want to include in the infographic. Completely strip your blog post down – getting rid of any words and sentences that aren't needed. Think about what the sections will be and turn long paragraphs and text into bullet points. You want to end up with is a clear title, sections, and bullets points (within each section), and a call to action at the end. This is your storyboard. You've got the storyboard. Let's create. There are a couple of options for doing this. One option is the DIY option. You can use tools like Canva, which is free (there is a paid pro version) and it has lots of infographic templates. There are other options aside from Canva that are free or not too expensive – ​this great article runs through a few. I would caution that it can be quite fiddly/hard and really quite time consuming to create good looking infographics, unless of course you're quite the whiz on Canva and similar tools. If you've got a designer who works in your team, then of course this is the perfect job for them. Otherwise, you should consider hiring a freelance designer to do this for you. If you're a Content 10x customer then we can create an infographic for you. There are a few different places that you could go to find a good freelancer. I recommend upwork.com. Otherwise, you can also go to fiverr.com as well. There lots of amazingly talented freelancers on these sites, and (warning!) there are also very poor quality freelancers too! You have to look at their ratings and their reviews, and not necessarily go with the cheapest! I would say that for a really good infographic, you're looking at probably around the region of $50 to $200. what do you share with your designer? ​You should provide your designer with your storyboard. In addition, if working with a freelancer be sure to share your logo, brand colors, brand fonts… If you have brand guidelines, then you're going to want to share those so that the infographic is well branded for you. Any reputable designer would ask for all of this as standard. In terms of the design, I recommend that you do one of two things. Either find infographics that you think look really good and share those with your designer...explain that you would like something to be created that looks similar. Or, you could sketch out what you want your infographic to look like (even just pen to paper, sketch it out, scan it and email it over to the designer). The more information that you can provide your designer the better. Your designer is likely to provide you with some JPEGs and PNG files, and a PDF file. I would also ask them for a thumbnail image of the infographic that you could use for social sharing. Always make sure that you focus on quality with your infographic. It needs to look really engaging, really professional and fun! 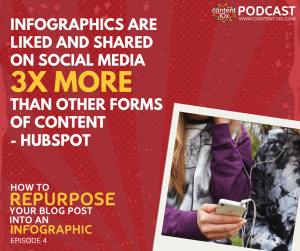 Whilst HubSpot have stated that infographics are shared three times more than other forms of content, you need to make people want to share it. They're going to want to share it if it provides really good information. If it's really useful, and really helpful, people will share. If you want people to share your infographic then make it really easy for them. If you're going to put it on your own website, then I really recommend making sure that you have some social sharing options (e.g social sharing widgets), and you can provide an embed code. You can add the "pin it" button with a Pinterest widget making it really easy for people to share it on Pinterest. One final tip is to make sure that you track your success as well. If you put the infographic onto your website, then it will be loaded in there as media and it will have its own URL. You can track that URL via your analytics. If you store your infographic elsewhere, like Amazon S3, you should still be able to track it. 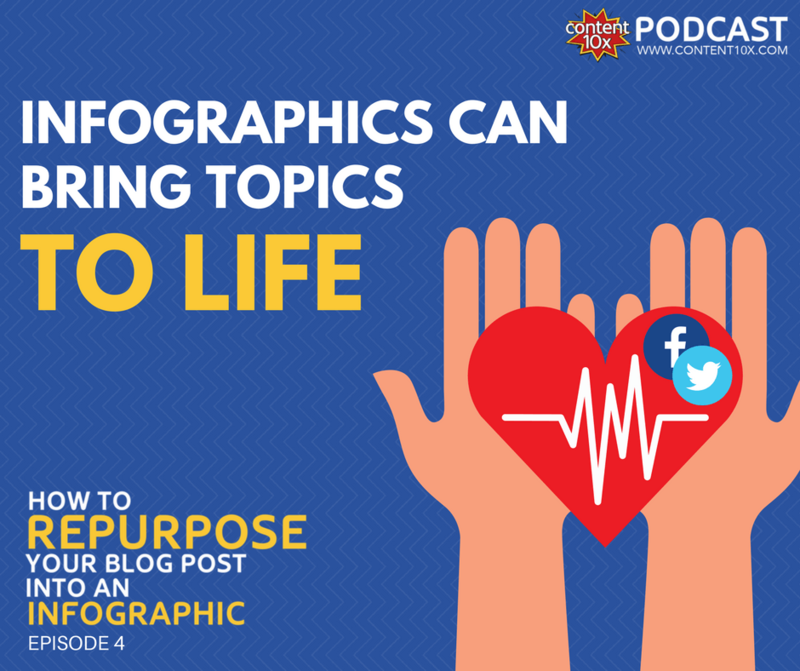 In closing, I hope I’ve convinced you about the virtues of infographics and you found the above helpful in terms of repurposing your blog post into an infographic. As a little bonus, have created … drum roll….. yes, you guessed it, an infographic about repurposing your blog post into an infographic! It’s right below this post (click it to download)! I would really like to hear about your endeavours with repurposing your content into infographics. Please do get in touch and comment below.